Can be easily retro fitted to your IGE, if Serial Number criteria is met. 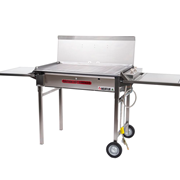 Will make your IGE more versatile with the ability to roast meats, breads, pizza, vegetables etc. and cook large cuts of meat, such as chicken legs, more thoroughly. This product sits on the inside of the hood of an IGE to hold/warm/cook veggies.